The man known to his legion of fans around the world as THE PROPHET nailed the recent spike in Bitcoin Value to over $10,000 USD in his famous book written over 3 years ago on Bitcoin titled BITCOIN ALGORITHM. Today THE PROPHET explained to me why $30,000 Bitcoin values is going to happen real fast since that is what his famous BITCOIN ALGORITHM says the coin is currently worth based on the huge user base of wallets the digital currency has gained. The BITCOIN ALGORITHM puts the current value of Bitcoin between $15,000 and $30,000 USD. So, the value of Bitcoin today (around $11,000 USD) is actually close to the low side of exactly what the BITCOIN ALGORITHM says the coin is worth. We are on the way to $50,000 Bitcoin Values THE PROPHET OF BITCOIN says and then $100K and even $500K values will be seen as long as humans and technology exists. Dr. Sol Adoni is the man his fans call THE PROPHET and he wrote a few years ago a great book titled BITCOIN ALGORITHM. He is a genius that has founded numerous tech companies in over 40 years of being involved in technology from early software companies he founded in the 70’s and 80’s and to many internet companies he founded as well as the huge 1 MEDIA Network he created that now operates hundreds of business portals and local search engines. This site is part of the 1 MEDIA Network as is 1 News, 1 Music, 1 Movies, 1 eBooks and local search portals such as 1 Search, 1 New York City, 1 Los Angeles and our little site called 1 Bitcoins. 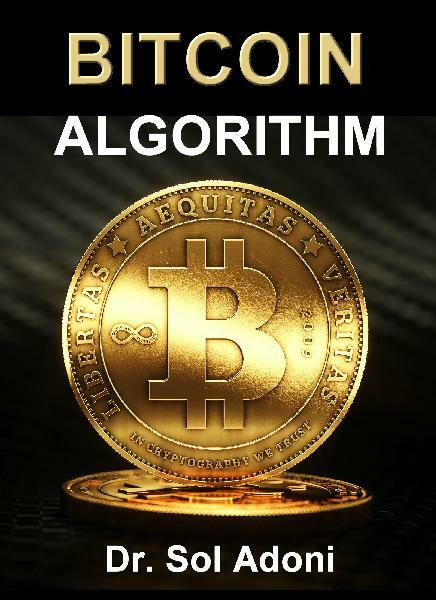 Dr. Sol Adoni explained his book BITCOIN ALGORITHM a few years that we would see $10,000 Bitcoin values tied to one thing and that one thing has indeed happened, so what he said would propel Bitcoin to the $10,000 value range. is the first valid way to explain the huge increase in value in Bitcoin. It’s actually pretty simple, the value of Bitcoin has moved in a simple algorithm since it was created tied to one thing. That is the amount of Bitcoin Wallets that exist. With only 21 Million Potential Bitcoins being the maximum number of coins that will ever exist, the currency hit critical mass recently when the number of Bitcoin Wallets exceeded the potential number of coins that will ever exist. The main wallet anyone can track is the Blockchain Wallet and it is publicly stating it has 19 Million wallets in use. Coinbase is adding over 50,000 new accounts a day. That’s over 18 Million new Bitcoin users a year. So, there are easily 21 Million wallets in existence today. If every wallet had just 1 Bitcoin that would exhaust the currency. Today most wallets that are created have fractions of the coin. New investors in Bitcoin usually don’t have the funds to invest in a full coin. Early Investors like Dr. Sol Adoni have lots of Bitcoins and all of the early investors in Bitcoin who invested in just 100 coins are now Bitcoin Millionaires. So Dr. Sol Adoni is now being called THE PROPHET OF BITCOIN by his fans and the media. He has taken Bitcoin on his network since 2010. He is the founder of an elite Bitcoin Casino and even created his own digital currency BizBytes for his network clients on his 1 Bartering Network. Dr. Sol Adoni even has that title in the world of music where his music videos predicting where earthquakes, hurricanes, terrorism and mass shootings would occur have been having exact hits. His prophecy music has made him one of the highest ranked bands on ReverbNation (20,000 Alternative Bands are on ReverbNation and his is Top 30 in the world) and his songs gathered over 30 Million Plays on SoundCloud giving him three #1 hits last year. So THE PROPHET OF BITCOIN is one and the same as THE PROPHET of Rock and Country Blues. who is know all over the world now thanks to his Prophecy Music as REX LUCIFERIUS is THE PROPHET to his fans. THE PROPHET has actually been in the Prophecy Business for over 20 years where he has amassed a legion of fans around the world and his most ardent fans are those who have followed his warnings about the future and sold off all their possessions and moved to what are now known as THE SAFE ZONE. Shortly after the year 2022 THE PROPHET has been saying for over 20 years that a major asteroid strike will occur on earth and 99.9% of humans are terminated and the planet reset by higher intelligence that has had enough of humanity and the constant wars and testing of nuclear weapons . Dr. Sol Adoni took time out of his busy schedule for a few minutes today to chat about Bitcoin and how his book nailed this $10,000 USD bubble. Dr. Sol Adoni‘s book put forth four bubbles in 2014 when he wrote BITCOIN ALGORITHM which is a book actually banned on NSA controlled Amazon due to Dr. Sol Adoni revealing Bitcoin came out of an NSA think tank. (This link shows Amazon says the Book is not available). This is a news story about Amazon banning the book. Satoshi Nakomoto is the code name the NSA gave to the fake phantom creator of Bitcoin that no one has ever met. The name means Center of Intelligence in Japanese and was an inside joke used by the NSA coders who created the virtual currency in 2008 to point to the CIA creating he coin.